Originally constructed to house wooden horse carriages downstairs and the accommodation for accompanying syce and grooms upstairs, Muntri Mews tucks itself into a dead-end lane that has been converted into a garden. 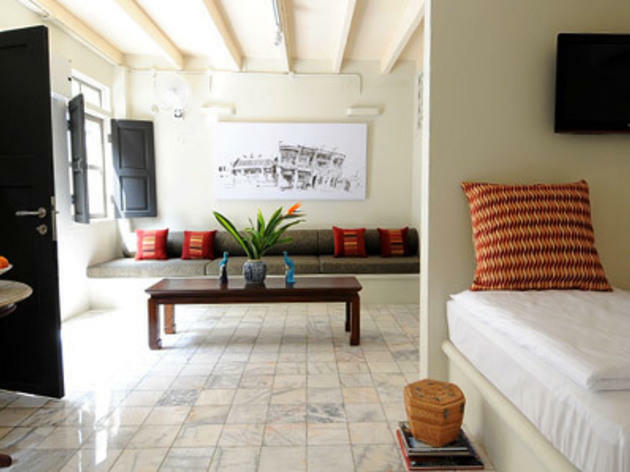 It’s hard to imagine open wooden carriages and horses in George Town today but this property is proof of all the influences that thrived in 19th century Penang. 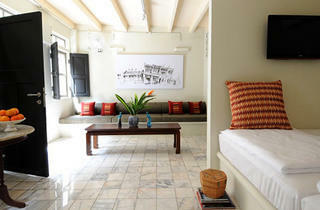 With only nine rooms and geared at the contemporary traveller, Muntri Mews still maintains its utilitarian authenticity. However, the way in which the rooms have been kitted out gives it a modern stylish kick. Lovely recycled marble tile floors downstairs add a little grandeur, while the wooden floors lattice work screens upstairs make for a warmer and cosier atmosphere. The simple interior provide clean comfort with four poster beds upstairs and double mattressed, 9-foot beds downstairs. The tropical lush garden terrace entry provides a welcoming retreat but equally pleasing to the eye is the upstairs long corridor. The grey palette is surprisingly welcoming as the black-and-white painted chicks add geometry and style to the place. The owner, Christopher Ong, has an eye for choosing slightly unusual properties. As an award winning hotelier, he aims to provide an authentic experience without having to sacrifice day-to-day comforts. Muntri Mews also provides cars and drivers for island tours on request and the in-house cafe makes easy snacks throughout the day and night. Rooms downstairs cost RM300 while those upstairs are RM360. Check out the great china shop at the end of the garden. Chris has collected stacks of vintage plates and bowls, all for sale. Muntri Street is located within an area where the young at heart are setting up many cafes and galleries, as well as a stone›s throw from the heritage landmarks. A sister property – Noordin Mew – will open in early 2012, catering to families and groups who want to pig out oat George Town’s local hawker centres and shop within the central Komtar district.